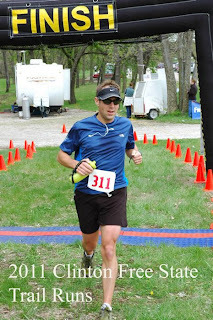 Sprint recap – 3:21:13. 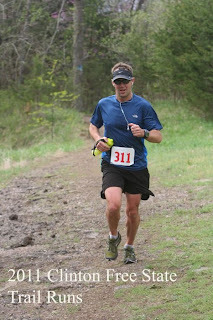 The race had great weather and great trail conditions. 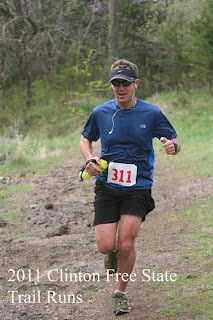 It was an excellent mid-west trail race that I would recommend and do again. I stepped on the scale – it read about 8lbs over my normal weight. Wow, the off season had been good to me. It was time to recommit, so I began to search the calendar - it was hard to find to a race that did not conflict with the kids’ events. 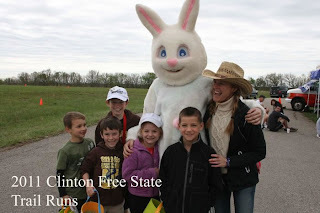 However, the Free State Trail run was over Easter weekend, and not much was happening that weekend for us – okay, I’ll chance it. 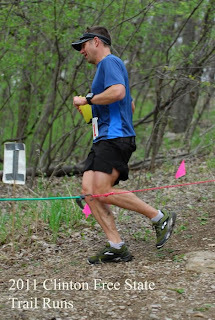 I know the race is well run by the Trail Nerds out of KC, and the course and race organization would not be a disappointment. I designed a running plan that basically consisted of a long run on the weekend, speed work/tempo runs twice a week, a midweek long run, and a couple of recovery runs. I incorporated a bunch of hills into the workout along with hitting some type of trail at least once a week. I developed a four week cycle, where weeks 1-3 get progressively tougher, with the 4th week an easy recovery week. With the help of Kelli, a nutritionist at http://www.apexnutritionllc.com/ who specializes in endurance athletes, I was able to recommit to healthy everyday eating, and getting the proper fuel for the level of running (60-90 miles a week) I was doing. Just prior to race day, I stepped on the scale and was about 9lbs under where I was at the beginning of spring. I was right in my goal race day weight. Looking back at my plan, I had hit many of my tempo goals. I had capped off my training with an 18 mile sub 7 minute run just two weeks prior to the race. I had hit the hills and trails hard. I was feeling confident where I was at, but was still unsure how fast I could run the challenging course. In the best of conditions, I was anticipating a 3:40 finish. Cliff and I left the hotel and I had a nice and relaxing ride out to start line. 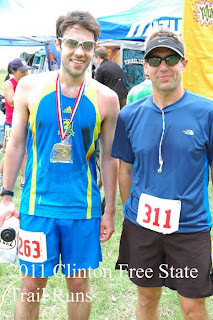 The ride was beneficial to me, Cliff had run this race a couple of times and gave me the details regarding the trail. It was great information to go over just prior to the race. We arrived, and headed to the check in tent. There was some sort of mess-up with my race registration, but the race volunteers quickly took care of me. Although there was hiccup, a well run race with volunteers who are knowledgeable and capable of handing these types of issues made this a non-issue. 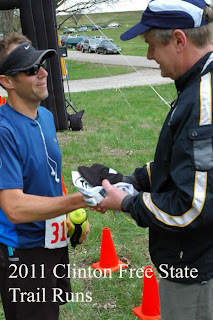 As we were waiting for the start, Cliff began joking around with someone from the Mich Ultra team. At one point, he wondered if in order to join the team, you had to fill your camel back with Mich Ultra and show you could finish the race. Not a bad concept, but the rumor was debunked and the race rep let us know getting on the team seemed to be either being a good runner or dependent upon who you know. Before I knew it, it was time to get to the start line. We toed up to the line; and Bad Ben (the race director) let us the marathon start was a half mile out and back on the road before hitting a prairie loop, then heading down to the single track trail. With that, we were off on the race! The weather conditions were about perfect, no wind, about 50 degrees and overcast. The first half mile went by quickly; I decided I wanted to hang with lead pack for bit as long as no one was blazing a trail. A quick glance down at my watch and a 7:20 pace on the road, I was already in the lead pack with a few runners. I settled in behind a guy in a blue racing singlet and a guy who appeared to be an experienced masters runner. I was running in 3rd place at this point. Little did I know exactly how much of the morning I would spend with these two guys. The prairie loop was in good condition, damp, but not muddy. The three of us kept together as we headed down to the trail. We were moving at a steady pace that I thought I could hold most of the day. Coach knew the trail like the back of his hand. Somewhere between miles 10-12 is a great wooden arch. Coach let me know that the local art teacher started putting one stick on the arch each time he rode under it. From what I could tell, the art teach had rode his bike under that arch about 2000 times. The rocks were difficult, however, I did my best to keep up with the train. Luckily, I only tripped once and caught myself before face planting. Whew! Way to close and I made it out of the most technical part of the trail without too much damage. At about mile 15, coach had fallen off the pace, and it was now Daniel Boone and me. We stayed together for the next 3 or 4 miles. 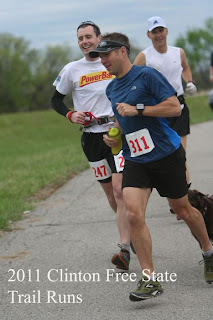 Daniel Boone was beginning to speed up and I stayed right with him – until mile 18. We came to an aid station. In this race, there were no pre-filled cups. You had to carry your own water bottle for hydration. We came up to the aid station and I quickly began to fill up my water bottle. Daniel Boone did the same thing. I really wanted to keep on top of my racing fuel, the only chance I really had against Daniel Boone was hoping he would hit the wall. I had to get a banana. Instead of grabbing and going, I stopped and tried to peel my banana. I couldn’t get it. Daniel Boone took off and after struggling to get the ! @#$ peel off, I finally was able to take off – about 30 yards back. Daniel slipped into the trails and every once in while I caught a glimpse of his blue shirt and shorts. It was a bit early to waste energy to try and catch-up – as long as I was keeping him in sight, I felt like I could still pick up the pace to try and catch him. With about 4 miles left in the race, I thought I better start to try and reel him in. I picked up my pace only to stumble on the rocky path. And stumble. And stumble. Then as I decided to speed up – I tripped and crashed onto the path. A quick assessment and nothing damaged. I pulled myself up and began to run. 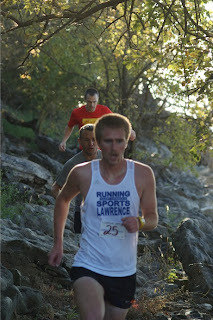 I then realized that I was trying to do too much at a pace that I couldn’t race at on the technical, rooty, rocky trail. I decided to continue to run hard, but I could not go too fast and out of control – another spill and I could really get hurt. I decided it was his race to lose, and my race to not let anyone come up behind me. A 2nd place finish overall for me 3:21:13.